While the importance of round-the-clock availability of specialist palliative care services has been recognised for more than a decade, it is often not available across all care settings. The government in England says that by 2020 there should be 24-hour access to end of life care for people outside hospital, in line with national policy. Guidance issued in February 2018 sets out the staffing levels needed to provide minimum and desirable levels of service for 24-hour specialist palliative care in hospital, community and hospice settings. The Night, Weekend and Bank Holiday Specialist Palliative Care Services document, produced by the Royal College of Physicians and the Association of Palliative Medicine, gives guidance on appropriate nurse and doctor numbers for telephone and face-to-face specialist services out of hours. Advanced nurse practitioners and senior nurse practitioners play a key part in the staffing advice. Service providers and commissioners can use the document to review and develop their services. The document makes recommendations about the level of competency of the nursing staff providing services. Models of care, where available, are identified for each level of service. Commissioners and providers should avoid creating an adverse impact on weekday services, the document says. An ageing nursing workforce and recruitment difficulties will make these plans challenging even if local funding is provided, the document says. Macmillan Cancer Support has identified a shortage of 3,400 clinical nurse specialists across the UK, which it estimates will rise to 7,000 by 2030. The plans could also be hindered by reduced opportunities for professional development due to continuing professional development funding cuts. Failures to address nursing workforce issues could affect patient choice and lead to poor continuity of care, low morale among staff and risk of burnout. Nurses working out of hours may work in isolation, so require a greater level of competency, the guidance says. Challenges that nurses may face out of hours include the lack of availability of the usual services, the need to make complex decisions while working alone, and assessing and managing risks with fewer resources. In areas where there is access to out of hours specialist palliative care it is often provided through collaboration between the NHS and hospices. 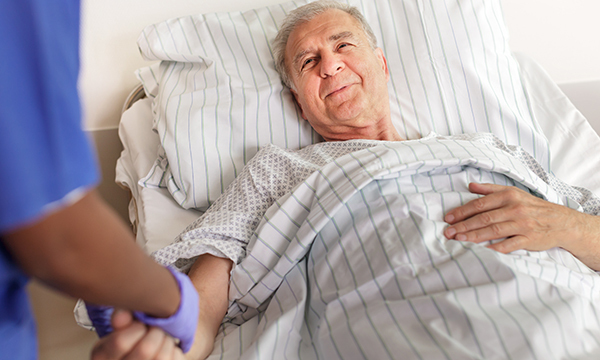 ‘Round-the-clock access to specialist palliative care, particularly for complex symptom management and psychosocial support, is essential to enable continuity of care for both the person who is dying and those who are important to them. ‘Currently, access to 24-hour care varies tremendously and is dependent on the commissioning of services in a given area. These vital services are a postcode lottery.